A line of energetic campers files out the door, awaiting the signal for dinnertime to begin. They stir with anticipation as the word gets out about tonight’s menu. Someone shouts, “It’s barbacoa night!” followed by a chorus of cheers and applause. The made-from-scratch barbacoa taco meal with homemade queso sauce is just one of the favorites at Miracle Camp. 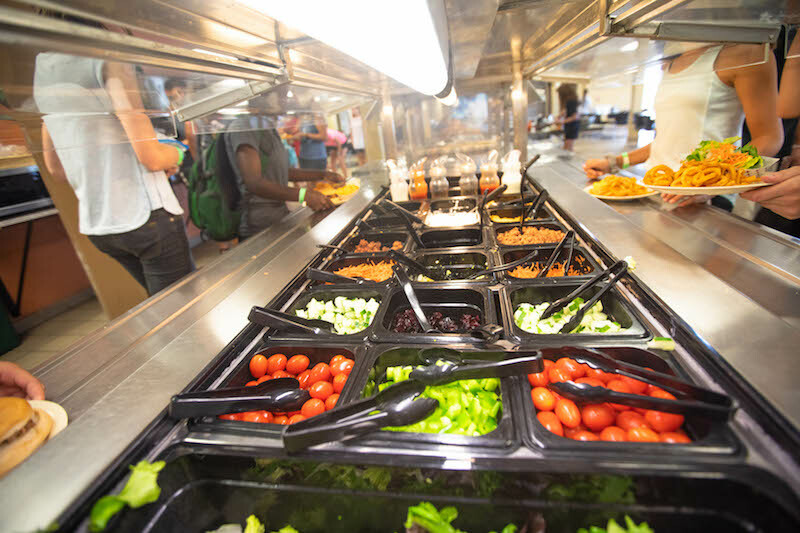 Unlike a week of grilled cheese and chicken nuggets every day, we value variety, high quality, and nutrition, redefining the stereotype of “camp food.” Every meal, campers are provided an array of options: a different main course and sides, along with a salad bar and selection of desserts. Breakfast includes differing main meal options and features a regular oatmeal and yogurt bar. Menu plans are designed accordingly for each week’s age group, implementing unique ideas, such as the bread bar during Senior High camp. A large amount of planning is required for the 50,000+ meals served between May and September. Not only do we strive for accuracy in quantity and excellence in taste, but accommodations for allergies are a high priority. Once the kitchen staff is aware of an allergy, they deliberately provide alternative food options for those who need gluten-free, dairy-free, or other selections. We are privileged to have Beau Graf as our Director of Dining Services. Previously working in our kitchen for three summers (from 1997-1999), Beau joined our full-time staff in May 2014. He works diligently along with 24 part-time employees to ensure that our dining exceeds expectations. Good food is a significant component of the camp experience. We are delighted when campers and guests are pleased with the cheesy potatoes, glazed ham, or carved pork loin with apple-cranberry chutney. And who doesn’t love a good chocolate chip cookie mallow-bar? We desire to provide excellent food to enhance your stay with us. If you would like to find out more about our dining services, click the button below!